AXS Studio science game developers Joyce Hui, Mike Kent, Susan Park and Brendan Polley recently stormed the Royal Ontario Museum (ROM) annual Game Jam for a sleep-deprived weekend of art and coding. Given 2 days to finish a space-themed video game, they rocked it. 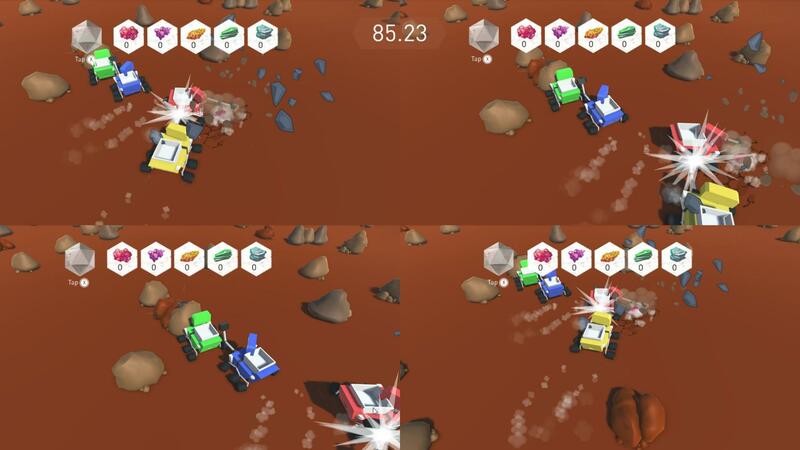 Rogue Rovers is an addictive, super-fun multiplayer game of discovery (and smashing) on the surface of Mars. Define team member roles before not during the Jam. Plan ahead so you’re only actually building at the Jam. Prioritize the must-haves and nice-to-haves. Match game goals to learning goals. If the game is meant to be educational make sure these goals are compatible. Be prepared to change things on the fly and go with the flow. Take risks. Play to your strengths, but don”t be afraid to try a new technique or software feature. Get up and move occasionally. No one wants a DVT at the game jam! Small is beautiful. Keep your scope small and focused; and make it excellent. TEST! TEST! TEST! Does it work and, more importantly, is it fun? !